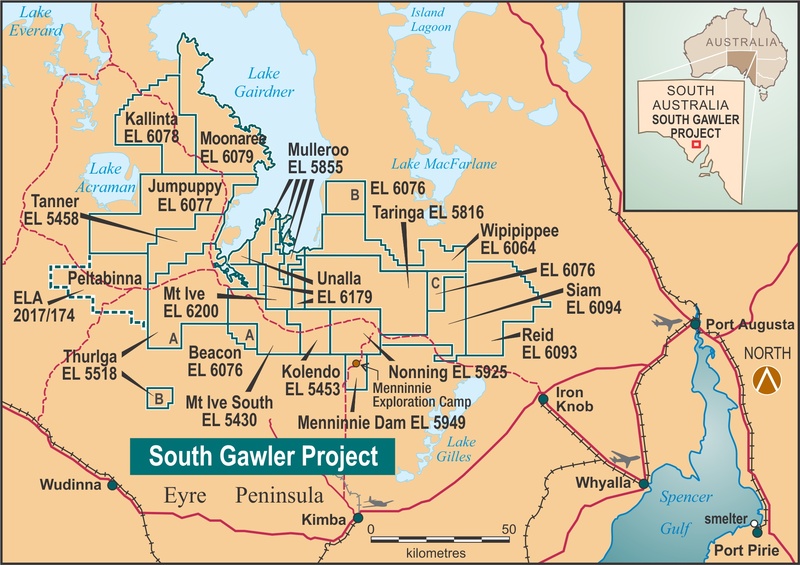 Terramin’s South Gawler Project (SGP) is located along the southern margin of the Gawler Ranges, northern Eyre Peninsula, South Australia (Figure 1). The Project comprises a group of seventeen Exploration Licences totalling 8321km2 and one Exploration Licence Application covering 637km2, all held by Menninnie Metals Pty Ltd (MMPL), a wholly owned subsidiary of Terramin. The Menninnie Dam tenement (EL 5949) hosts the Menninnie Dam Ag-Pb-Zn deposit and the broader project area is prospective for a range of deposit types that host combinations of gold, silver, copper, molybdenum, lead, zinc, rare earth elements, graphite, and tin ± tungsten. The SGP covers extensive exposures of the Gawler Range Volcanics (GRV) formed by large-scale eruptions of felsic magmas associated with the widespread emplacement of high-level granitic intrusions and associated mineralising systems approximately 1.59 billion years ago. The GRV and underlying metamorphic rocks are prospective for a range of mineral deposit styles that include various combinations of gold, silver, copper, molybdenum, lead, zinc, rare earth elements, graphite and tin ± tungsten. The prospectivity is evidenced by numerous mineral occurrences in the region, and the presence of several significant deposits. The latter include the 42Moz Paris silver deposit located just 6km to the south of EL 5430 and the 7.7Mt Menninnie Dam lead-zinc-silver deposit located on the SGP’s EL 5949. The Menninnie Dam deposit – the largest undeveloped lead-zinc deposit in South Australia – consists of two main mineralised zones: the Menninnie Central zone, and the nearby Viper zone. The lodes at Menninnie Central and Viper have been combined to estimate a JORC 2004 compliant Inferred Resource totalling: 7.7Mt @ 3.1% Zn, 2.6% Pb and 27g/t Ag, at a 2.5% Pb+Zn cut-off (ASX: TZN 1st March 2011). MMPL is currently focused on targeting shallow Iron Oxide-Copper-Gold (IOCG) deposits likely to be associated with GRV-hosted epithermal hematite-quartz vein and breccia systems that are widespread throughout the SGP area.